The covert blooms of wild ginger reward those who know when and where to look for them. 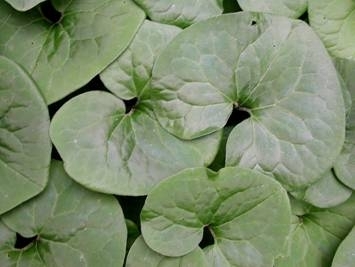 Wild ginger is a low herbaceous plant. The stem consists of a branched creeping rhizome at or just below the soil surface. Soft-hairy leaves arise in pairs annually from rhizome branches. Petioles can be up to 20 cm long, elevating the 7—25 mm wide kidney-shaped leaf blades above the forest floor. Small flowers appear in the spring shortly after the leaves have expanded. Typically, one must push the leaves aside in order to glimpse the jug-like flowers. A single flower stalk appears between the paired leaf bases, but it is short and barely lifts the flower above the soil surface. Each flower consists of 3 fused sepals that enclose 12 stamens and a 3-lobed pistil; petals are absent. The fused sepals constitute a pale green bell-like tube that ranges from 8 – 16 mm long; their divergent tips are maroon to brown. In different populations, sepal tips can be remarkably variable in terms of orientation (reflexed or spreading), shape of the tapered point, and overall length which ranges 5 – 15 (or more) mm long. The stamens have separate filaments that extend as bristle-like points above the short pollen-bearing anthers. The stigma is coarsely and weakly 6-lobed atop a thickened style; ovary position is inferior by virtue of its fusion with the interior surface of the sepal tube. Appearance of the ovary changes little as it matures into a fleshy brown capsular fruit. Seeds are about 5 mm long and bear an oily elaiosome along one side. Asarum is a name of ancient Greek origin but the basis for its application to this plant is obscure; “canadense” means, literally, “from Canada,” but this species is widespread in eastern North America. Several named varieties have been distinguished in the past, based largely on length, shape, and orientation of sepal tips; these forms intergrade freely over broad geographic areas and most botanists opt not to give them formal recognition. Five additional species of Asarum occur in the western US and several more are known from Eurasia. Asarum is closely related to the genus Hexastylis which consists of ten species from North America differing from Asarum in details of ovary position, dissection of the styles, and absence of anther appendages. Many species of Asarum and Hexastylis are known colloquially as wild gingers; species of Hexastylis may also be called little brown jug or heartleaf. 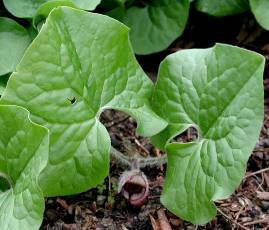 Asarum is classified in the birthwort family (Aristolochiaceae). True gingers, aromatic plants from tropical countries, are not closely related to Asarum. Wild ginger has a long history of medicinal and culinary use by Native Americans and early settlers of eastern North America; similar uses are recorded for related species found in Europe and Asia. Despite these traditional uses, current knowledge should inspire caution: evidence exists for both efficacious medicinal properties and toxic reactions, including potentially carcinogenic properties. Safe advice is that wild ginger should not be consumed in any form for any purpose and reports of medicinal and culinary use should be viewed strictly as historical information. Wild ginger is a plant of rich deciduous woodlands. In favorable sites the rhizomes can support dense mats of foliage that exclude other forms of vegetation for the span of a meter or so. Flowers appear in April or May, but they are usually seen only after pushing the leaves aside. 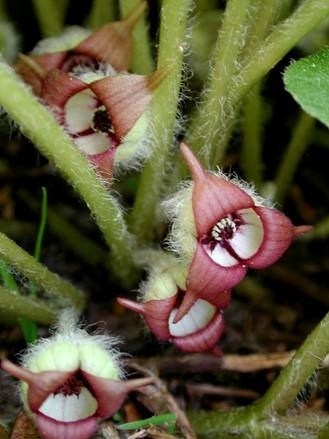 The curious flowers of wild ginger have generated much speculation and serious study concerning their mode of pollination; it seems that while pollination by flies is possible, most seeds are products of self-pollination. In summer, ants, attracted by the oily elaiosome appendage, disperse Asarum seeds across the forest floor. Leaves are deciduous, dying to the ground over winter. Wild ginger is an excellent subject for naturalistic woodland settings and shade gardens in general. Its chief virtue in the garden is rapid growth resulting in a dense ground cover composed of attractive leaves. The plants do best in shade with rich organic soils of acid reaction; supplemental watering will be beneficial during summer dry spells. Slugs and snails sometimes attack wild ginger. Vegetative propagation can be accomplished by division of a colony into smaller clumps or by cuttings of individual rhizome pieces. Propagation by seed is possible, but the seeds are best sown immediately after being shed and must be kept moist; germination may also be delayed until after the seeds have experienced a cold spell. Asarum canadense occurs throughout much of the northeastern United States and adjacent Canada. It is absent from Florida and reaches its western limit in the gallery forests of the Great Plains. In Virginia it has been documented in all the counties of the mountains and piedmont region; it is less common on the coastal plain, having been documented in nearly half the counties of that region. The main threat to this relatively common native species in Virginia is habitat destruction. Gardeners should not collect wild ginger in the wild and should be certain that all native plants purchased for home gardens are nursery-propagated, not wild-collected. For a list of retail sources of nursery-propagated plants and responsibly collected seeds, see elsewhere on this website. Text from 2010 Wildflower of the Year brochure written by W. John Hayden and adapted by him for the web. January 20, 2010. Photographs by W. John Hayden.